What Is Semi Vitreous Porcelain? 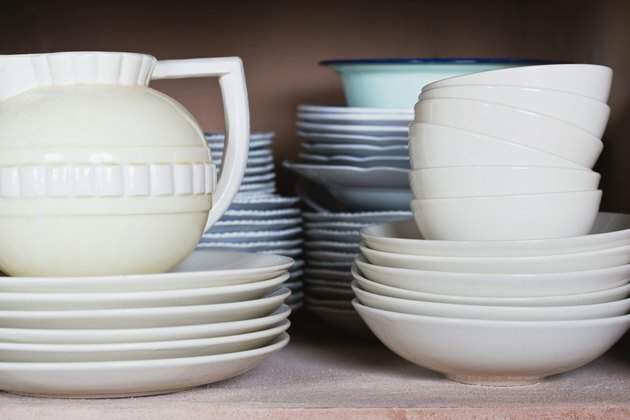 One way to categorize types of porcelain is by how much moisture they can hold. Porcelain can range from nonvitreous, which holds the most water, to impervious, which holds very little. Semi vitreous porcelain falls in the middle of this range. Porcelain is commonly used to make tiles and pottery. It is nonporous and stain-resistant. This type of porcelain can absorb between 3 percent and 7 percent water. Semi vitreous porcelain is recommended only for indoor use. Do not use semi vitreous porcelain where it will have a lot of contact with water, although it can get wet occasionally. According to StarCraft Custom Builders, this type of porcelain is good for use as the backsplash in a kitchen. With collectible pottery, a symbol next to the maker's mark may signify which type of porcelain is used; S_V stands for semi vitreous. Shanon Ottaway has been writing professionally since 2009, specializing in instructional articles on animals and parenting for various websites. Ottaway is a graduate of Northern Michigan University, where she received her Bachelor of Science in English with a writing emphasis. Can You Use Regular Bathroom Ceramic Tiles for a Swimming Pool? Can Porcelain Tiles Withstand Heat?